These words of wisdom come from European IT services provider Steria, which along with hundreds of its customers are charting a journey to hybrid cloud while maintaining control, automation, and reporting across all IT infrastructure. 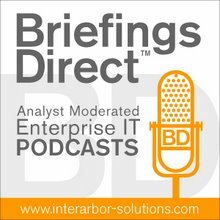 To learn more about how services standardization leads to improved hybrid cloud automation, BriefingsDirect spoke to Eric Fradet, Industrialization Director at Steria in Paris. The discussion, at the recent HP Discover conference in Barcelona, is moderated by me, Dana Gardner, Principal Analyst at Interarbor Solutions. Gardner: How are your activities at Steria helping you better deliver the choice of cloud and software-as-a-service (SaaS) to your customers? The cloud must not be seen as disruptive by our customers. Cloud is here to accompany your transformation. It must be a benefit for them, and not a pain. Gardner: And in order for that transition from private to public or multiple public or sourced-infrastructure support, a degree of standardization is required. Otherwise, it's not possible. Do you have a preferred approach to standardization? Gardner: Of course, once you've been able to implement across a spectrum of hosting possibilities, then there is the task of managing that over time, being able to govern and have control.